Color is everywhere in Mexico, streets and markets, food and flowers, homes and gardens. 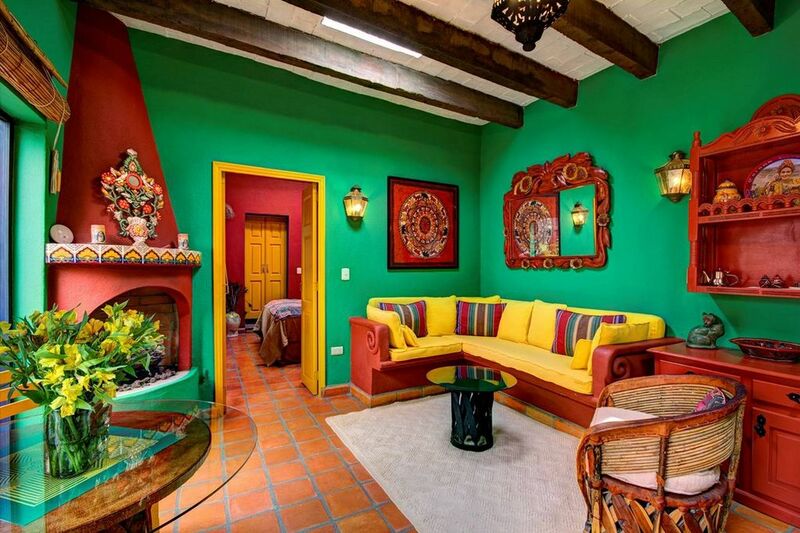 Our casita is no exception, and it clearly reflects the exuberance of rich colors freely combined in the unique Mexican way. This Mexican relationship to color is alive in our light-filled one bedroom casita, recently converted from a wing of our antique colonial home in the historical center of San Miguel. The main room with gas fireplace combines living/dining area, and kitchen with full sized fridge and stove. Sunshine beams in through skylights and two glass paneled double doors open out to your own private patio, the perfect place to enjoy meals alfresco. The bright sun filled bedroom with queen size bed has skylights for star gazing and a window facing the courtyard's fountain and flowers. The en-suite bathroom is decorated with a colorful hand painted ceramic sink. Casa Mandu is a large walled garden property containing the Casita, the owner's home, a historic adobe hacienda,and a two bedroom Garden Villa rental unit. As well, a guest suit in the main house with queen sized bed and attached bathroom is available for short term rentals for guests of our Casita or Garden Villa. The lush walled garden behind the main house is a quiet retreat for all. Our bubbling fountains will soothe away your cares as you read or relax in the shade of our 100 year old mesquite tree. Pomegranate, avocado, orange and lime trees also compliment the garden and butterflies and hummingbirds visit daily. Maid service is provided daily and is included in the rental price. Located in the Historic Center of San Miguel, a 3 block, level walk finds you in the main square. (El Jardin). Colonial architecture, historical landmarks, fine restaurants, cinemas, pharmacies, artisan markets, art galleries and supermarkets are all within easy walking distance. The Canadian owner lives on site and can advise you on dining out, places to visit and arranging transportation to and from any of the area airports. Our property is located in the heart of the historic center a few minutes walk to everything, yet the garden provides a quiet welcome oasis in which to relax and enjoy the natural beauty of the lush vegetation. I wanted to be in the center of town, close to everything. Right in the historical heart of San Miguel, I can be in the Jardin in a few minutes. There is no need to have a car since everything is close by. Walking the quiet cobblestone streets, lined with flowers, on the way to my favorite cafe reminds me always to be grateful that I chose San Miguel as home. Magic happens here on a daily basis, and at Casa Mandu I am right in the center of it all, but our garden oasis is the perfect place to relax with a book or just sit and watch the butterflies flit from flower to flower. The outstanding colonial architecture feels like you are in Europe. Cultural events abound, concerts, lectures, historic parades, always something interesting and entertaining happening to enjoy. 1. THE MEXICAN PEOPLE ARE WARM, FRIENDLY AND INVITING. THE CASA MANDU APARTMENT IS VERY CLEAN AND WELL APPOINTED. 2. THE OWNER WAS HELPFUL. 3. ELECTRICITY IN MEXICO IS INEXPLICABLY EXPENSIVE. GAS IS THE STANDARD. YOU MUST LEAVE A WINDOW OPEN IN ORDER TO USE IT. SCARY. 4. OWNER HAS A HEIGHTENED VIGILANCE ABOUT RAISING HER ELECTRICITY RATES. UNDERSTANDABLE. 5. UNIT - ESPECIALLY BEDROOM WAS ICY COLD IN DECEMBER AND JANUARY. 9. MY NEXT RENTAL, DELORES DEL RIO, WAS WORN COMPARED TO MY FIRST CASA MANDU, BUT WAS NOT AS COLD. 10. JUST KNOW THAT DECEMBER AND JANUARY ARE ICY COLD AT NIGHT. BUT SUNNY FOR FIVE HOURS IN THE MIDDLE OF THE DAY. 11. QUESTION THE TRAVELER'S MAGAZINE ARTICLE CALLING SAN MIGUEL DE ALLENDE THE MOST DESIRABLE CITY IN THE WORLD. 12. REALLY HYPERBOLE. LEARN TO BE READ CRITICALLY. 13. THE COBBLESTONE STREETS AND SIDEWALKS ARE ROUGH TO NAVIGATE. 14. OTHERS VISITORS WERE UNDETERRED. 15. MAKE UP YOUR OWN MIND. Casa Mandu Casita was even more wonderful than we expected it to be. The casita is decorated in bright, vibrant colors, very clean and contains all amenities. It is located just a few short blocks from the Jardin which makes it most convenient for shopping, restaurants and all the other activities San Miguel has to offer. If we return to San Miguel, which we more than likely will do, we will be staying at Casa Mandu again! Thanks Linda, for your kind words about our property Casa Mandu. It was lovely having you and your husband staying with us. We hope you return again soon. Ruth Hayward provided us with a wonderful colorful1 bedroom casa. As pictured. the room felt spacious with shelves appropriate for our misc. and clothes.We had our own patio and table outside our door which extended our feeling of spaciousness. Amazing! What a beautiful place! Ruth is such an incredible host. Everything about the casita is beautifully appointed and I immidiately fell in love with the decor of the entire home. Everything is very well stocked if you'd like to stay in for dinner or walk down the street to the many restaurants in the area. The location can't be beat. In the middle of centro but once through the main doors it's like being in your own oasis. The attention to detail from Ruth's team is great and everyone is so friendly, thank you to Christopher and Rufina. Thank you Ruth for hosting us in your amazing home and sharing your wonderful stories! We hope to come back again soon! 100% recommend! We highly recommend this property, it is located in a very desirable area of San Miguel de Allende. Easy access to restaurants, shopping and touring. Our experience was absolutely awesome, the casita was always clean, welcoming and comfortable. The hosts; Ruth and Kris were a joy to deal with, prompt attention and always willing to provide tips on daily events or where to go. I encourage you to book with Ruth if you're interested in an unforgettable experience. A Wonderful Home Away from Home! The Casita at Casa Mandu is just a perfect place to stay.! I was there for one month and I felt like it became my home. The entire property is beautiful and charming and offers a calm atmosphere to come back to after a day of wandering in San Miguel. Ruth was more than helpful and offered a lot of advice in so many ways. She saved me the last day when my shuttle did not arrive on time and was able to get them to send another driver to get me to the airport on time. The Casita is just a 10 minute walk to the center of the town and if I needed a taxi at night I was able to easily get one at the nearest corner. Rufina, the maid, kept the casita sparkling clean and I truly enjoyed the comfortable bed with the clean white sheets and comforter. The patio area outside the casita is lovely place to sit and perhaps have a few friends over for a glass of wine. A big thank you to Ruth for providing such a lovely place to stay!!!! Leon airport (BJX) is about 2 hours away. Queretaro Airport (QRO) about 1 hour and 20 minutes, and Mexico city (MEX) is 4 hours. You can book a direct shuttle from any of these airports on line at: info@bajiogo.com They will need the name of your arrival airport, your flight number, and scheduled arrival time. Our address in San Miguel is: Casa Mandu, Hernandez Macias 24, San Miguel Most shuttle drivers know our property and they will bring you right to our front door.